The BEST Strawberry Jam without pectin. 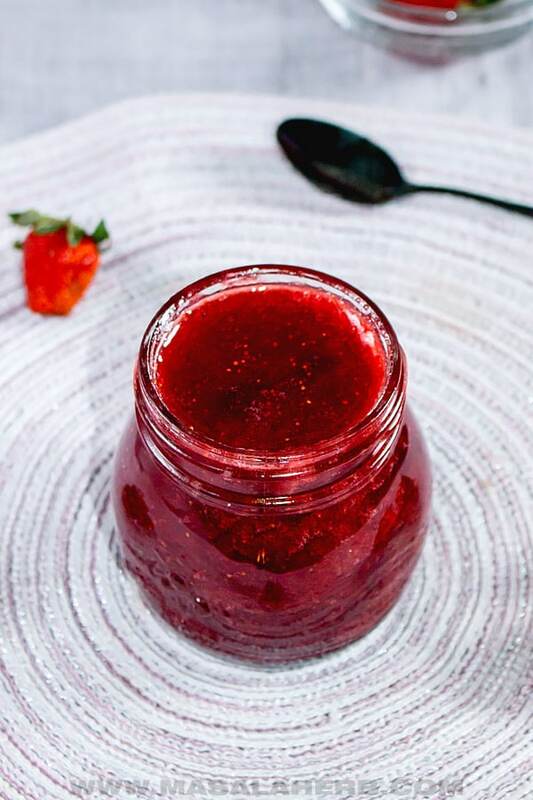 Only natural organic ingredients make this beautiful strawberry jam. 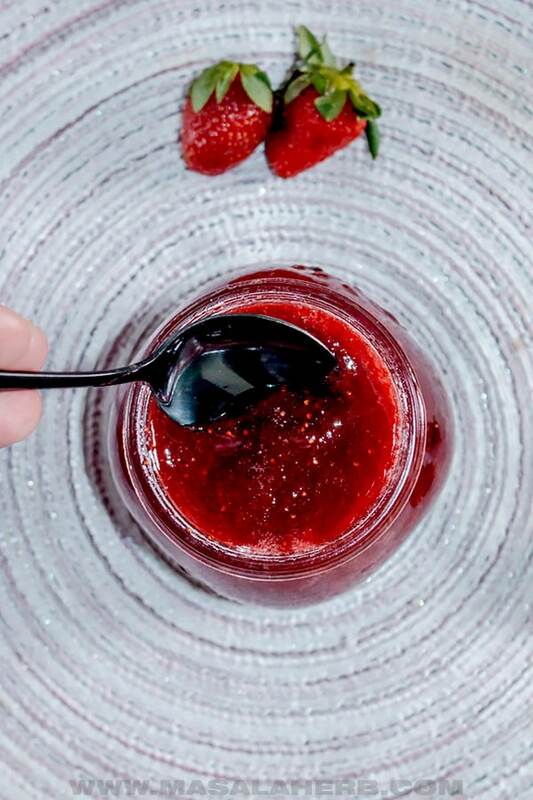 I share my tips, tricks and complete recipe, so that you can make your own strawberry jam asap! I hope you are ready for strawberry season, because I have got you covered already with my strawberry rhubarb jam. BUT I’m not done because one of my all time favorite jam recipe is the bright red and complex fruity Strawberry Jam (without any other fruit). The fruits are washed, stems removed and the fresh Strawberries are cut small. Sugar and Lemon are added to the Strawberries in the jam pot and brought to a rolling boil. Your organic strawberry jam continues to cook on a simmer over a period of 30+ minutes until setting point. The setting point is determined with a candy thermometer or a simple test. The jam is then easily reduced to a puree with a blender stick and then canned in clean sterilized jars. What’s the jam setting temperature? The Strawberry jam is set when the candy thermometer has reached 220 Fahrenheit/ 105 Celsius. How else can I check if my jam is set? Your jam will be very hot and in it’s hot form, it will always look liquid (even when it’s set). Think candy, it’s stone hard when cold but melted when hot. When you want to test the setting temperature, take a drop of simmering jam and drop it into the cold plate. Move the plate around. If the jam runs, it’s not set, if it doesn’t move it is set. Because the plate is ice cold, it instantly cooles down the hot drop of jam on the plate, which enhances us to determine if the jam is set. If you are new to preparing homemade jam, use the thermometer and the plate setting test. Preparing and canning strawberry jam is easy but I know it can be tricky when you havn’t had someone show you in person or when this is your first time. These are some of the questions that have been asked over the year on my other jam recipes. Please red through properly and sent me a mail if something is still unclear. Why is my jam runny? Your jam is runny when it didn’t set. You didn’t cook it long enough and perhaps your fruit is not that rich in natural pectins. Some fruits are more suitable then others for jams. Fruits high in acidity such as green apples, citrus fruits, lingonberries and red currants are rich in natural pectins. Strawberries do not contain all too much pectin. We remedy this by adding lemon juice and I like to add lemon peel as well during the cooking process. Citrus fruit peels are high in natural pectin! In away this is a strawberry lemon jam. How to fix runny jam? Take it back to the jam pot and cook until. It’s easier to fix runny jam then hard jam. Why is my jam stone hard? Your jam is stone hard if you over cooked it. This can happen, especially if this is your first time and you get stressed out about the setting point. That is why you should test if your jam is set. Don’t over cook. Jam appears liquid, even when set, which is misleading and the chance that you over cook your strawberry jam is great. How to fix over cooked jam? That’s literally a tough one! 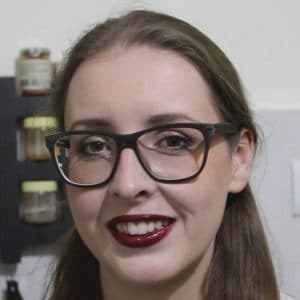 Either you find uses for your overcooked jam in your cooking and baking, or you add it back to the pot and cook it a bit with water to turn it a bit liquid again. You would have to use it sooner than later because you added water. Water reduces the shelf life. Store the fixed jam in the fridge and use within weeks. If the jam is not only hard but tastes over cooked, it might not make sense to cook it again with some water. 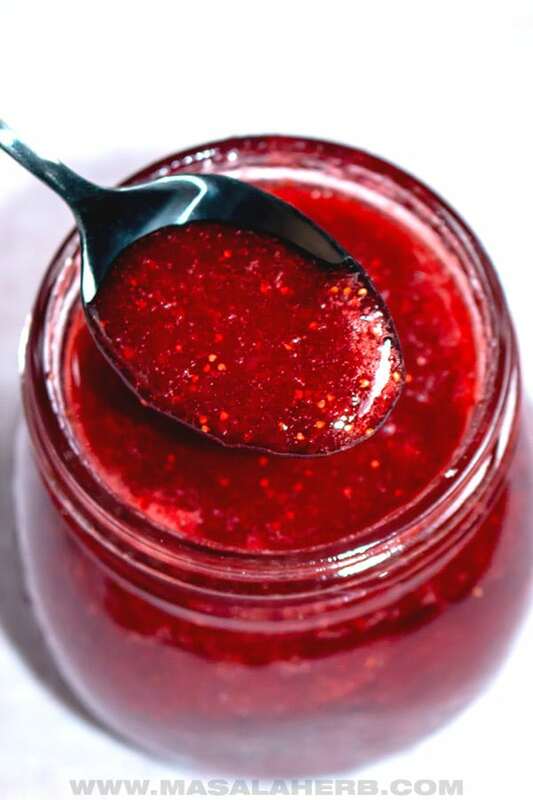 Some readers simply mixed this jam into their foods with other ingredients to not let it go to waste. Why don’t you add pectin to your jams? I don’t add artificial pectin gelling sugars to my jams because my recipes are from my French heritage and we don’t add artificial preservatives. We can do without pectin sugar because we add regular sugar and another ingredient that adds natural pectin. Besides I don’t enjoy jams that contain pectin. It tastes weird and the consistency looks unnatural. Why do you add so much sugar to your strawberry jam? The sugar in your jam helps to preserve the fruits for months to come. Don’t ever reduce the sugar amount in my strawberry jam recipe without pectin. This would reduce the shelf life of your jam and you would end up with mold on your jam. One batch of jam equals about 3 small jars, which in turn results in about 70 servings. 1 Serving in my book is 1 Teaspoon. 1 Teaspoon jam is less than 100 calories, less than most cream cheese pies and pancake breakfast servings. French people are mostly healthy and they eat a lot of homemade jams. Nobody adds 2 tablespoons of jam on their bread, that just isn’t healthy. Remember Paracelsus’s saying: The dose makes the poison. How long to cook my Strawberry Jam? Your jam will take +30 minutes to cook. It can even take an hour. Don’t look too much at the time, but keep an eye on the setting point instead. How to store the Strawberry Jam? Store your jam always in clean sterilized jars. To sterilize your jars and lids, keep them in boiling hot water or place into the oven. That way all germs are killed. Fill your jar up to the rim. This is important because when you lock it with your lid, you don’t want air inbetween. When there is air, there is germs. Another trick is to pour a few drops of vodka/rum/ or whatever neutral drinking alcohol into the lid to kill remaining germs. I used a strawberry Schnapps in my strawberry jam. Close your jam jar with the lid well, and quickly turn it upside down to create a vacuum. Leave it upside down until the next day. Once you have opened your jam, it turns into a refrigerator strawberry jam. Don’t risk and leave it out. The more humid your environment, the more likely your jam will grow mold. Don’t store your jam in humid places such as a cellar. The Best Strawberry Jam Recipe without pectin. I add lemon juice and the lemon rind to my jam. The lemon flavor brings out the strawberry taste and helps in preserving the jam for a long period of time. (Please read through the post properly for tips and detailed info). Wash your Strawberries well and pick out the ones that are getting moldy and spoiled. Only keep healthy fruits. Cut off the stem and cut your strawberries small. Place the Strawberries into the jam cooking pot. Add the sugar, lemon juice and the lemon rind. Place on the heat, mix and slowly bring to a rolling boil. When you think it’s set, blend with a hand blender to a smooth consistency. Test setting temperature with the candy thermometer: 220 Fahrenheit/ 105 Celsius. OR test by dropping the hot jam into a frozen plate and if it’s not running, it’s set. If it’s running leave it to simmer further. Read up all the details in the post to get it right. 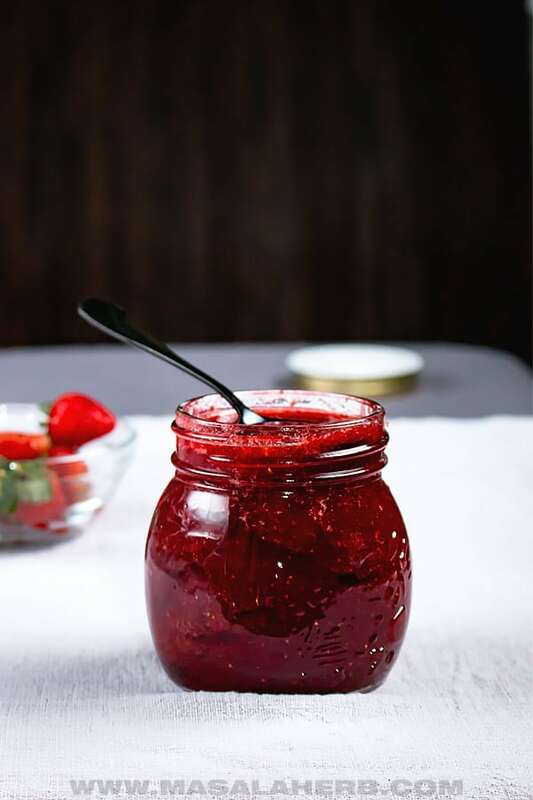 Keep your clean sterilized jam jars ready and fill up with the still hot jam up to the rim. Drop some vodka or rum into the clean lids to kill any germs left. Close the filled jam jar with the lid well and quickly turn upside down to create a vacuum. Leave the jar that way until the next day. Then label with jam name and date. Store in a cool and dry place. Store in the fridge once opened. Do not reduce the sugar amount. 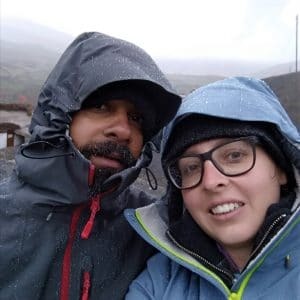 Read up in my post why. Use the lemon juice and the lemon rind in your jam. The rind contains plenty of natural pectins, which helps to set and preserve the jam. Use an organic untreated lemon too if you use the rind in the jam because of the pesticides. Serving of 70 Teaspoons = about 3 jam jars. Use quality glass jars and proper jam making equipment. Dear Reader, How are you planning to use your Homemade Strawberry Jam? This is so easy. I will definitely be making this soon. 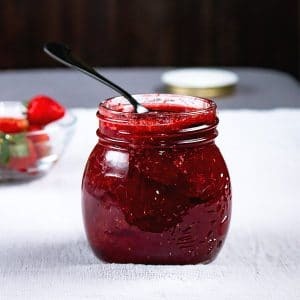 Hi, this may be interesting you: Easy Strawberry Jam Recipe!